Wat is dit voor site? Wij zoeken de goedkoopste boeken op internet. 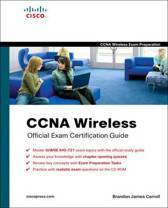 CWNA Certified Wireless Network Administrator Study Guidevonden we het goedkoopst op Bol.com voor €36.29. We hebben gezocht in nieuwe en tweedehands boeken. Rechtsonderaan de pagina kan je het boek direct bestellen	via Bol	.com. 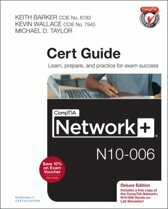 The bestselling CWNA study guide, updated for the latest exam The CWNA: Certified Wireless Network Administrator Study Guide is the ultimate preparation resource for the CWNA exam. 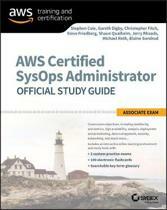 Fully updated to align with the latest version of the exam, this book features expert coverage of all exam objectives to help you internalize essential information. A pre-assessment test reveals what you already know, allowing you to focus your study time on areas in need of review, while hands-on exercises allow you to practice applying CWNA concepts to real-world scenarios. Expert-led discussion breaks complex topics down into easily-digestible chucks to facilitate clearer understanding, and chapter review questions help you gauge your progress along the way. You also get a year of free access to the Sybex online interactive learning environment, which features additional resources and study aids including bonus practice exam questions. 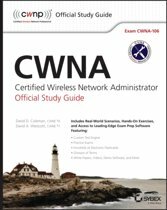 The CWNA exam tests your knowledge of regulations and standards, protocols and devices, network implementation, security, and RF site surveying. Thorough preparation gives you your best chance of passing, and this book covers it all with a practical focus that translates to real on-the-job skills. 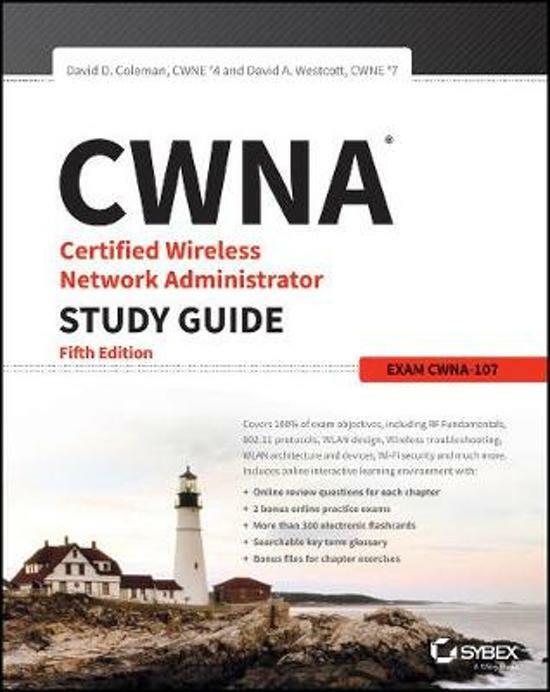 Study 100% of the objectives for Exam CWNA-107 Assess your practical skills with hands-on exercises Test your understanding with challenging chapter tests Access digital flashcards, white papers, bonus practice exams, and more The CWNA certification is a de facto standard for anyone working with wireless technology. It shows employers that you have demonstrated competence in critical areas, and have the knowledge and skills to perform essential duties that keep their wireless technology functioning and safe. The CWNA: Certified Wireless Network Administrator Study Guide gives you everything you need to pass the exam with flying colors.